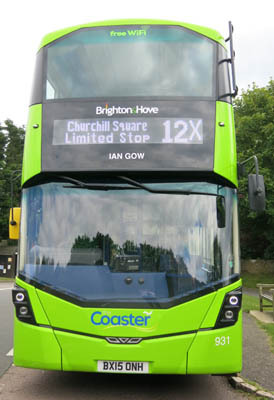 Connections with Brighton and Hove Coaster country: Ian Gow was elected to the House of Commons as Member for Eastbourne in February 1974. When Margeret Thatcher became Prime Minister in 1979, Ian Gow was appointed to the important role of Parliamentary Private Secretary to the Prime Minister where he was viewed as an indispensable asset. By 1983 the Prime Minister decided that Ian should take on Ministerial office and he was promoted to Minister for Housing and Construction. In 1985 he moved up to the Treasury but before he had time to make his full contribution there he felt that he had to resign from the Government over the completion of the Anglo-Irish Agreement. Prior to entering parliament, Ian Gow had served in the British Army’s 15th/19th The King’s Royal Hussars, reaching the rank of Major, he knew and understood the province as few Englishmen do, developing a feel for the people of Ulster. When the casualties of terrorism mounted as he had forecast, he consistently spoke out in the House and to the media. He well knew the risk that his strong voice might one day be silenced but he always refused to take anything in addition to routine security precautions. Ian Gow was murdered by the Provisional IRA on Monday 30 July 1990 when they placed a bomb under his car at his constituency home in Hankham. His death has been mourned by all sides of the House of Commons, by his Eastbourne constituents and by people of all occupations and persuasions. Known for his sense of fun, on 21st November 1989, Ian Gow made history by becoming the first MP to deliver a speech in the House of Commons with television cameras present. Whilst moving the Loyal Address at the opening of Parliament, he referred to a letter he had received from a firm of consultants who had offered to improve his personal appearance and television image, he made a few self-depreciating jokes about his baldness. Although much missed in Government, Ian Gow remained a loyal and close friend of the Prime Minister and his commitment as Member of Parliament to his Eastbourne constituency is still acknowledged and respected by all political sides all these years later. 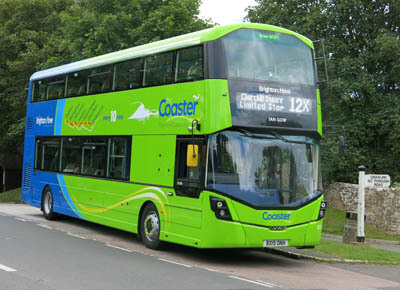 931 Mercedes Streetdeck - carried name since delivery in April 2015 on Coaster Route 12.